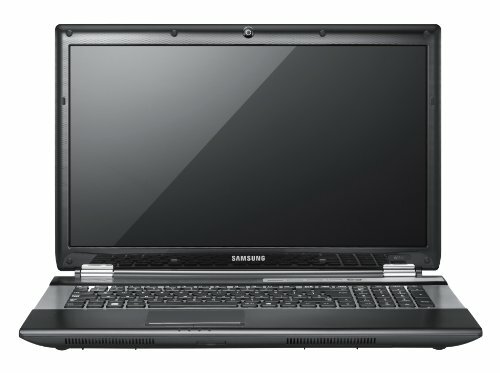 The Samsung RF711 is a 17.3" high performance multimedia laptop, aimed at the higher end of the notebook market. Offering the latest Intel Core i7 2670QM 2.2GHz processor, 8GB of RAM and a huge 1TB Hard drive, this laptop should provide lightning fast computing no matter what your requirements. Also included is a Blue-ray drive, all running on Windows 7 Home Premium. At around the £750 mark, this laptop is by no means cheap - however on the specification alone you do seem to get a lot of notebook for your money, all encased in a beautiful exterior. Read on for our review of the Samsung RF711 notebook. Below is our review of the Samsung RF711, a 17.3 laptop, featuring 8GB RAM, 1TB hard drive and Windows 7 Home Premium 64-Bit. Based upon the appearance of the rest of Samsung's notebook range, you'd expect them to have put a lot of thought into the design and appearance of their higher end laptop models. Upon unboxing the Samsung RF711, you would not be disappointed - the lid has a black glossy finish, with a starburst effect underneath. It does look impressive - however it does somewhat attract fingerprints due to the shiny finish - so may need a quick dust down every now and again in order to maintain it's good looks. The actual hinges contrast nicely with the black, finished in a chrome finish. At just 3.2 cm thick, it isn't the slimmest notebook out there, but the extra length required to accommodate the larger 17.3" screen makes this laptop appear thinner than it actually is. It measures a total of 27.6cm high by 41.6cm long, and as such should still be just about suitable for commuting and use whilst on the move, feeling relatively light for it's size, weighing just 2.9kg. Upon opening the lid, you are faced with a well designed silver and black interior - with a smooth black palm rest and touchpad, and black keys surrounded by a brushed silver panel effect. The keyboard feels very comfortable to type on, as you'd expect from one of Samsung more expensive offerings. Each individual key, measuring 15mm by 15mm, has a reassuring action, and they are well spaced out, with a gap of approximately 4mm; this helps avoid typing errors, and will also make cleaning the controls far easier. None of the keys produces much noise, and the action means that for those who prefer to watch their fingers rather than the screen whilst typing, you can instantly tell if you've applied enough pressure to input the character. The interior doesn't have a great deal of flex to it, and feels fairly solid to the touch, without adding to the overall weight of the notebook too much. The touchpad, as per the rest of Samsung's laptops that we've tested, feels comfortable to use - it's smooth surface is very responsive and accurate. measuring approximately 104mm diagonally, it is also fairly generously sized, and offers multi touch control, if required. Situated below are the two buttons, which also feel like they'll put up with year's of wear and tear from regular usage. As mentioned previously in the RF711's specification, the display is catered for with a 17.3" LED backlit "SuperBright" Samsung screen, which is designed to provide especially sharp pictures and vivid colours. The display being 16:9 ratio means that black bars associated with media playback, are absent on this device, with the picture filling the screen without being distorted, making this notebook highly suitable for multimedia playback. This is especially useful given the inbuilt blu-ray player. The standard HD resolution is 1600 pixels by 900 pixels, but you also get the option of the full HD of 1920 pixels by 1080 pixels. All this combines to make the Samsung RF711 very adept for both working on and media playback. One small downside is the screen reflecting it's surroundings - making working outdoors and in sunlight a touch uncomfortable - however indoors this did not impede us at all. The inbuilt 3w stereo speakers offer great sound, especially considering the relatively small size and weight of this notebook. We have no complaints here whatsoever - all of our tester found that music, and audio from multimedia came through very well. Inside the laptop you'll find an Intel Core i7-2630QM processor, running at 2.2GHz, and when combined with the substantial 8GB of RAM supplied, this notebook flies along, handling multitasking with ease. It also handled both photo and video editing with relative ease, indicating that this notebook will be powerful enough for the majority of users. We are confident you will not have any issues with speed of this laptop - it simply flies along. The 1TB hard drive will provide you with ample storage for your personal files, software installations, music and photos, although there is also room for future expansion should you wish to fit a second drive for extra capacity and backup purposes. In terms of connectivity you get 2 USB 3.0 ports (one to the side, and one to the back of the notebook), 2 regular USB 2.0 ports, HDMI and VGA output, ethernet, as well as separate headphone and microphone jacks. Also included is the aforementioned Blu-ray drive, and an SD card reader. The battery of this laptop was pretty good - in no small part thanks to it's inbuilt energy saving functions - lasting around five and three quarter hours during usual usage in our test, and around two and half hours during DVD playback. This is pretty good, especially for a 17.3" screen laptop, and will make it suitable for those who are away from electricity supplies whilst travelling and commuting. Operating duties are provided by the standard Windows 7 Home Premium software, which loads and runs at a very fast speed due to the processor and RAM supplied. So who is this laptop aimed at? At around £750, it is a considerable investment - however it offers a very high specification for the money. It excels at media playback, as well as handling all but the most intensive of tasks with ease. The sound and display are great, and overall build quality is also very impressive. Also worth bearing in mind is the second drive bay, enabling you to upgrade this notebook with a SSD should you wish. Pros: Decent screen and battery, amazing specification, runs very fast, plenty of storage, and an empty drive bay for upgrades. Cons: Screen can reflect the surrounding environment. In short, this laptop will make an excellent investment for students, commuters and households alike, providing years of speedy and hassle free computing. Due to the cost of this notebook, those with young children may wish to keep it away from small inquisitive fingers, but asides from that this notebook has a wide appeal, and will not disappoint, giving the power of a desktop in the form of a notebook.